1 of 1 Stir together soy sauce, honey, vinegar, garlic, sesame oil if using, and ginger in small bowl. Whisk in canola oil. 1 of 2 Heat oil in large nonstick skillet over medium-high heat. Add onion; saute 2 minutes. 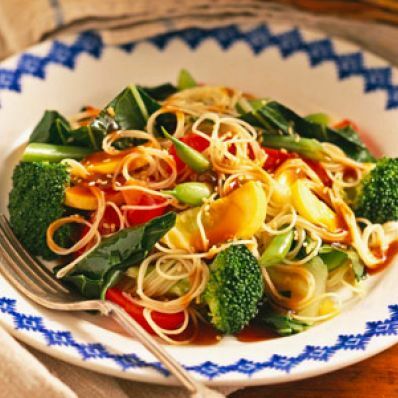 Add broccoli, squash, red pepper, green beans and 1/2 cup sauce; cook 3 to 5 minutes. Add arugula and bok choy; stir until wilted. Add remaining sauce. Bring to boiling; cover and cook until beans and broccoli are tender, about 7 minutes. 2 of 2 Serve over cooked pasta. Top with sesame seeds.